Welsh international striker Steve Morison experienced some crazy times during his spell at Elland Road following a transfer from Norwich City that saw Luciano Becchio move in the opposite direction. During the 2013 winter transfer window, the internet gossip columns were swimming with rumours that Becchio would be leaving. He had played a lead role in a new look Leeds side, managed by Neil Warnock, but the Gaffer admitted, after a typically poor Leeds performance away at Barnsley, that the Argentine's head had been turned. "I had been suffering with an injury at Norwich City and despite talk of a transfer away from the club, Chris Hughton assured me I wouldn't be leaving. He wanted me to stay and compete for the number 9 role with Grant Holt. "Sitting at home one day,I received a call to inform me that City had done a deal with Leeds United for Luciano Becchio and I would be moving north as part of the agreement. "I had 18 months left on my contract at Norwich and seemingly they had no interest in what I wanted. Although I had no prior knowledge of the move, the facts were that I wasn't starting on a regular basis so the opportunity to move on, sign a three year deal and play regular football was appealing. "Some Leeds fans assumed (and still do) that Becchio was forced out of the club. That wasn't the case. He had been offered, and turned down, the deal that I had signed. "Neil Warnock sold the club to me and he informed me that although he had the option to sign Craig MacKail-Smith, I was his first choice." "There were some ridiculous rumours flying around concerning the amount of money I was earning. It was suggested that I was picking up £20,000 per week - those suggestions were some way off the mark. "Admittedly, I was on a couple of grand a week more than I was on at Carrow Road but my wage was some way off the figure being talked about. "The truth was, I was given the chance to play football every week and that is what I wanted, despite dropping into the Championship but looking back, I wasn't honest with myself. "Due to the injury, I was a couple of weeks away from being fit but made my Leeds debut away at Wolverhampton." Leeds were having a bit of a mixed time and despite a famous win in the FA Cup over Tottenham, results in the league were in-different. "It was nice to score for Leeds at Elland Road and a few weeks later, I scored twice in a draw at Crystal Palace but the injury was still bothering me and I continued to do myself an injustice." "Brian McDermott came in and I still wasn't right. He asked me what the problem was and I told him that I had been struggling with a groin injury. "He told me it was important that I got myself fit and although I started against Sheffield Wednesday, I missed the following game before coming back as substitute for the fixtures against Birmingham and Brighton." "I spent the night in hospital after the Watford game, not knowing that I would be on the move before the new season started." "I spent the 2013-14 season on loan at Millwall, a club I was more than familiar with. I was determined to prove McDermott wrong in his decision to let me go as he was looking to bring Noel Hunt to Leeds." "By the time I returned to Elland Road, there had been many changes. Massimo Cellino had took control of the club and after sacking McDermott, he appointed Dave Hockaday as Head Coach. "To be fair to Hockaday, he was a good coach and that is exactly what he was. He never picked the team and he never signed the players. Someone else took on those responsibilities. "There were new players turning up for training left, right and centre and the camp was split between the British born players and the continental lads that had been brought in. "Most of us liked Hockaday, we enjoyed his training methods, we liked his ideas and the sessions were enjoyable but once the season started, some of us were not playing games. "No matter what the results were, the foreign players always played whilst the likes of me and Luke Murphy were training with the kids and although I had finally got myself into good shape, I did not feature in the first team until the end of September when Neil Redfearn was in temporary charge." After seemingly steadying the ship with impressive wins over AFC Bournemouth and Huddersfield Town, Redfearn's time as caretaker manager came to an end and Darko Milanic was appointed into the role. "I never started a game during Darko's time at the club but Redders, again, brought me back into the picture and I was desperate to do well for him but in truth it was difficult. The previous 18 months had been tough and I was fighting to save my career. "In all honesty, the club was a circus. On the way to training every day, you had no idea what was in store. I had never experienced such a crazy situation and it was a difficult time. "My wife and son were still based in Norwich when I moved to Leeds, and eventually we moved across to Northampton where my son was settled in school. We enjoyed the life we had and didn't want to unsettle it. "I lived in Leeds during the week and my family would come up for the weekend if we had a home game, despite the fact Cellino insisted the squad stayed in the Marriot on a Friday night, practically across the road from where I was based. "If we had an away game in the south, I would be thinking, I can be back with my family within a hour, but no. Cellino insisted that everyone had to travel back to Elland Road and then I would have to drive all the way back. He controlled everything we did and very little common sense was applied." "Out of the blue, Thompson was suspended and eventually dismissed. Nobody really understood what was going on, even Redfearn! Thompson was well liked and most of the lads were in disbelief." "It was difficult to concentrate on the job we were being paid to do. We trained on the Friday before travelling to London and then players started dropping like flies and stating they were unavailable to play. "Nobody can say that they weren't injured but I found it odd that they were fit enough to finish the session before "picking up injuries". The lads who did play were determined to put on a good performance for the manager and the supporters but despite me getting on the scoresheet, we were beaten 2-1." "Uwe Rosler was brought in during the summer and after he signed Chris Wood, I knew I would be playing second fiddle. "Although Rosler was keen for me to stay, the powers that be made it clear that they wanted me to move on and knowing that Millwall were desperate to sign me, it was time to go back to the New Den. "It is a major regret that I wasn't given the chance to enjoy the club, and the supporters, as much as I would've liked. There were some great people behind the scenes and although there were some truly crazy times, I know that Cellino left Leeds United in a decent shape and finally, the club looks like it is on the up again." 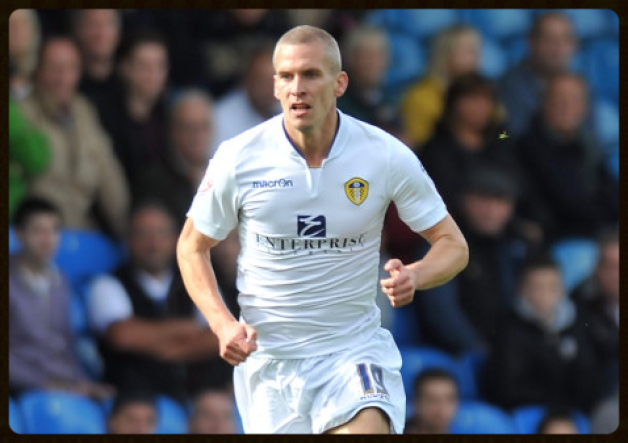 Thank you to Steve Morison for giving me his time and the opportunity to write this article.